The San Diego Regional Fire Foundation honored several local firefighters and their departments this week. 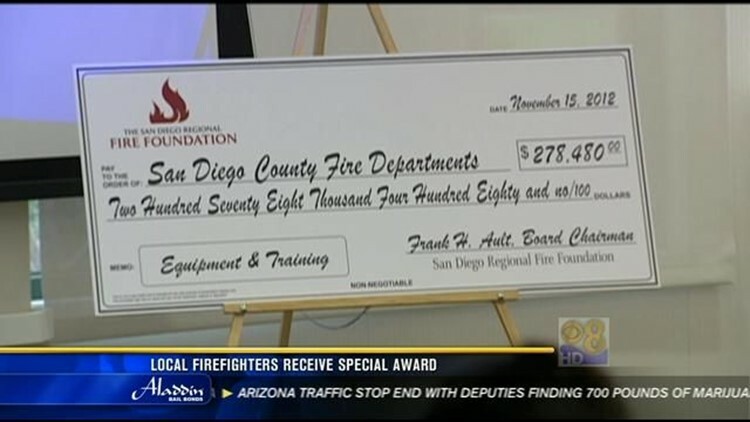 SAN DIEGO (CBS 8) - The San Diego Regional Fire Foundation honored several local firefighters and their departments this week. This year, the regional fire foundation gave out more than $278,000 in grants to volunteer fire agencies across the county. Thursday, they also gave awards to some great firefighters. "Because we have 400 volunteers in the county, we are selecting a "volunteer of the year" from each of the 18 departments and they are being honored today and recognized for the services they provide," said Frank Ault with the San Diego Regional Fire Foundation. The San Diego Regional Fire Foundation is dedicated to helping fire agencies by providing grants that allow them to buy more equipment.